All of these puzzles have been created by Ellie. Feel free to copy them and use them in schools and for competitions, but be sure to mention where you found them! This is the word search puzzle Ellie created for the Huntly Primary School for Fairtrade Fortnight 2017. See if you can find all the snacks hidden in the grid! See our "Facts" page for some fun food facts about the words listed in this word search! Can you help Daisy Divine find her favourite chocolates? COMPETITION : It's February - let's banish those January blues! 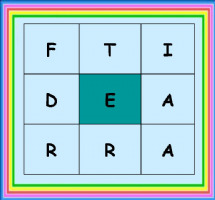 Find as many words of 4 letters or more from the grid pictured all of which must contain the letter in the middle square. There is one 9-letter word. The person who finds the most correct words wins a £5 gift voucher to spend in-store or online. Entries in by 8pm Sunday 5th February 2017. Entries can be submitted via our facebook and twitter pages, by email or you can pop them in to our shop. 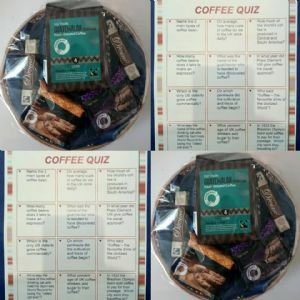 This competition has ended but you can still have a go - we got 73 words - see how many you can get!